All Library locations are accessible to people using wheelchairs. PARL offers a variety of materials of particular interest to persons with sensory and cognitive disabilities. * Some of these services require patrons to sign a print-disability self-declaration form. Please visit one of our branches for further details. 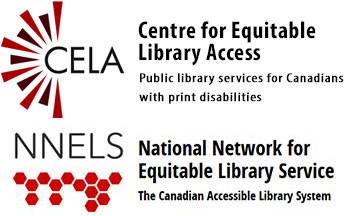 PARL is pleased to offer a variety of services for patrons with print disabilties, through CELA (Centre for Equitable Library Access) and NNELS (National Network for Equitable Library Service). These services provide downloadable audio and electronic book formats (DAISY, MP3, e-text), described video, and braille to Nova Scotians with print disabilities. People can sign up to download books at home to their own devices or computers, or get help with downloads from library staff. CELA also offers home delivery of materials, and a collection of titles available on-site in our branches. What is defined as a "print disability"? CELA & NNELS titles can be used on a wide variety of devices, including computers/laptops, iPad, iPhone, Android devices, MP3 players, DAISY readers, and can also be burned to CDs. How can I get registered to start using these accessibility services? NNELS website (https://nnels.ca) - Includes tutorials on downloading NNELS titles and other useful information. CELA website (http://iguana.celalibrary.ca) - Includes tutorials on downloading CELA titles and other useful information. Bookshare (https://bookshare.org) - The world's largest online library of accessible reading materials. Already registered? Log in with your library card.